There's no better way to start your day off than with a heaping bowl of Raisin Han. The Star Wars Celebration is an official Lucasfilm event designed to celebrate various aspects of the sci-fi series and to give fans yet another reason to don Stormtrooper outfits. This year, Jon Stewart of Daily Show fame will be conducting an hour-long interview with Star Wars creator George Lucas. Sounds amazing right? 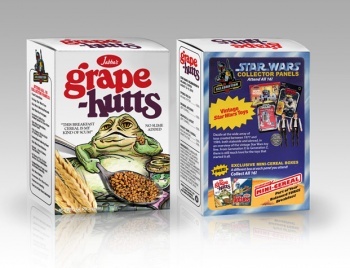 Forget about that, because the real star is a set of sixteen mini-cereal boxes being given away that feature Star Wars themed mascots. 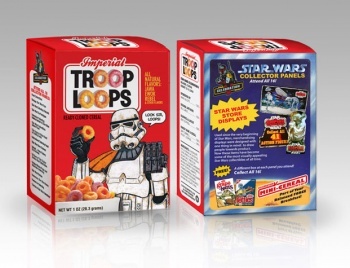 Can't find the Troop Loops? Just follow your blaster rifle! Grape-Hutts thankfully has "no slime added," but I still think I'm going to take a pass. 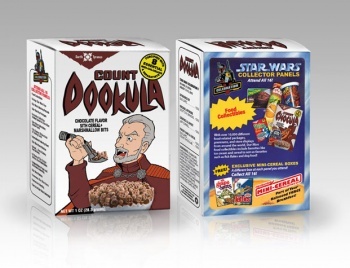 Count Dookula uses quite the elaborately made spoon to eat his chocolate flavored sith cereal with marshmallow bits. Out of the sixteen total boxes that will be available at Star Wars Celebration V this year, which takes place from August 12-15, eight have been revealed at StarWars.com. 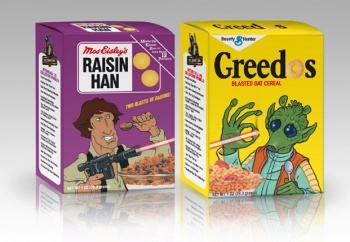 The pair everyone will want to get are a box of Raisin Han and a box of Greedos (seen below), which when put side by side show Han Solo firing off a blast at the too-slow alien bounty hunter. With only 400 of each box being produced, they're sure to become valuable collector's items not only because they're rare, but because they're so damn cool. 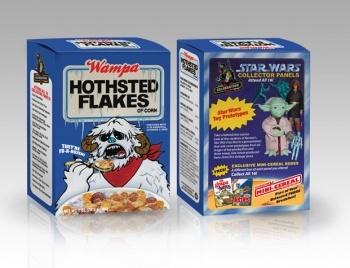 I know if these cereals were real I'd be eating them every day. Except for Grape-Hutts.